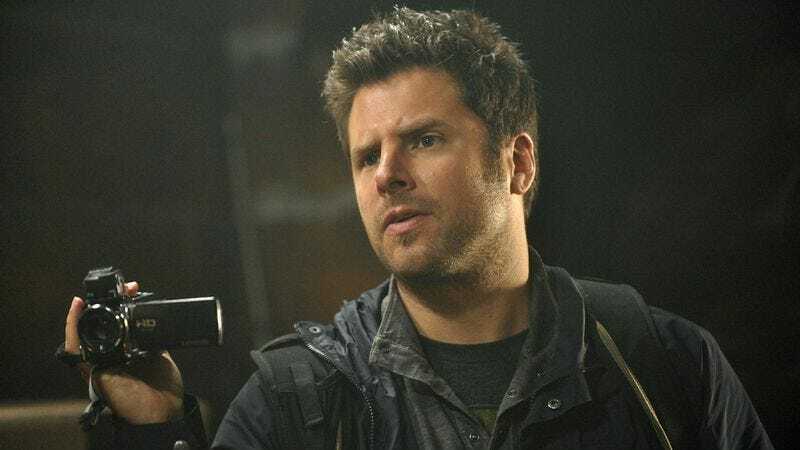 Psych has never shied away from homage episodes absolutely no one is clamoring for, which explains how a seventh season episode channels The Blair Witch Project, with some healthy doses of Bigfoot conspiracy thrown in. “Lassie Jerky” has more than a handful of hilarious throwaway lines, some badass action for Juliet, and a reasonable justification to alter the visual aesthetic of the show to include lots of handheld cameras—even a cell phone held vertically at one point. But the final 15 minutes lurch off the rails in tonally absurd fashion, and the tacked on return to the normal visual style muddles what could have been another intriguing stylistic experiment. Shawn and Gus meet up with two student filmmakers trying to win a Student Academy Award by making a documentary about Bigfoot. Right off the bat, the justification for Shawn and Gus showing up is tenuous—Shawn wants to win the award, and has enrolled Gus in a college class without his knowledge, then lured him to the woods with the promise of an exclusive barbecue joint. But hey, it’s an arbitrary move that gets them into the woods, out of communication range, and picking up handheld cameras a la Blair Witch. The two filmmakers, Chavo and Katie, fall into different archetype categories. Shawn and Gus keep insinuating that since Chavo is a bigger lad, he’s bound to fall behind and get eaten, and Kate makes her sexual openness incredibly obvious with every passing minute. She makes advances on Gus, but settles for going after Chavo. It’s a character trait that works and earns a laugh when used sparingly, but grating and reductive when it’s the only significant attempt at characterization. A four-person episode with only two series regulars is an appealing experiment, but even after the first big twist—the four run away from the blind after “Bigfoot” approaches, and Gus falls into a pit with three dead bodies—there has to be another contrivance to bring more regular characters into the mix. Sure enough, Lassiter and Juliet pop up shortly thereafter, drawn to the woods by the abandoned blueberry on the side of the road, which they then leave to walk aimlessly through the forest in search of Gus and Shawn, naturally. This is starting to sound like I really hated the episode, and I didn’t, at least not entirely. After Juliet and Lassiter show up, and everyone is trapped in the woods trying to figure out if the Bigfoot they’re seeing is a conspiracy, the episode veers into live-action Scooby-Doo territory, which is the best blend of funny and spooky that Psych can shift into. The bodies in the pit mysteriously disappear, Lassiter steps in a bear trap, and an eagle grabs one of the cameras, only to drop it on Lassiter as he clings to a tree while stuck in a creek. That action sequence, with all the falling and chasing and rescuing, has laughs, and so does Lassiter’s pure Blair Witch confessional homage, where he sits in the dark, losing blood from his leg wound, apologizing to and complimenting the people he cares about. In a show chock full of witty banter, it’s always the way Lassiter shows cracks of humanity in his pompous attitude that gets me the most. With many of the characters holding cameras, it allows for some expected jokes about the documentary style. Juliet questions whether Shawn should keep filming on multiple occasions, and when Kate or Chavo are confronted with turning off the cameras, they respond with a rallying cry of, “People need to know!” The altered cinematography is a nice change of pace, and it plays into Shawn’s (contrived) desire to make a documentary of a failed Bigfoot documentary—Lost In La Mancha to Kate and Chavo’s The Man Who Killed Don Quixote. The first big twist toward the end of the episode works. Bigfoot is the rather deadpan and delightful WWE wrestler Big Show (in character of course), who saves Lassiter and lives out in the woods to get away from all humanity, walking around in a camouflage suit. Shawn’s snooping makes him the prime suspect for the missing bodies, but when everyone confronts Big Ed Dixon, the episode takes it one twist too far. The area of the woods they’ve been scouting is a dumping ground for the Serbian mafia, who figured out via Kate and Chavo’s blog that they were getting too close to potential evidence, which brings a group of militant mafia members with significant firepower down on Ed’s cabin. The violence—bullets flying, axes in the back, everyone but Shawn, Gus, and Juliet getting shot—doesn’t mesh with the rest of the episode. Introducing the Serbian mafia may explain the bodies, but it’s an extreme leap from the Bigfoot documentary and lack of actual investigation that goes on. The finale becomes the last stand of a survival action film, and while Juliet looks really good because she saves the day—with some help from a sharpshooting Lassiter, before a gunshot wound in the shoulder becomes his second injury—that doesn’t reconcile how crazy the tonal shift feels. Even using “Yoshimi Battles The Pink Robots Pt. 1” can’t save the peculiar end to the case. Gus and Shawn’s witty banter suddenly becomes inappropriate, and the quaint conspiracy documentary spirals completely out of control. And then there’s the button, with the entire episode to that point forming Shawn’s film that will never see the light of day since it’s evidence. Everyone from the woods, plus Henry, Woody, and the Chief watch the screening, and then once it’s over, they clap and congratulate and sit around awkwardly in the police station. Kate hits on Henry, Gus and Shawn argue over proper credit, and the whole coda feels unnecessary. It’s as if there wasn’t any natural way to end the episode other than what amounts to a big group hug and slap on the back. These sorts of style homages have a mixed track record on Psych. I loved last season’s Indiana Jones-inspired case with Despereaux, but not every style experiment comes fully formed. “Lassie Jerky” is one of the latter category, seemingly conceived as all style without a solid story foundation. 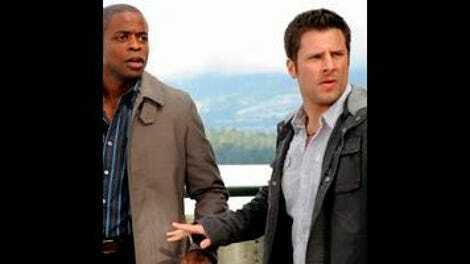 It has plenty of the little things that keep Psych entertaining, but it’s not as strong as last week’s episode, and doesn’t deserve mention in the company of other, better homages the series has done. “You know Gus and I thought about doing the same thing after we saw The Village, but then we didn’t, because that movie was horrible.” I’m a The Village apologist, but it really is the first sign of monumental decline in Shyamalan’s work.